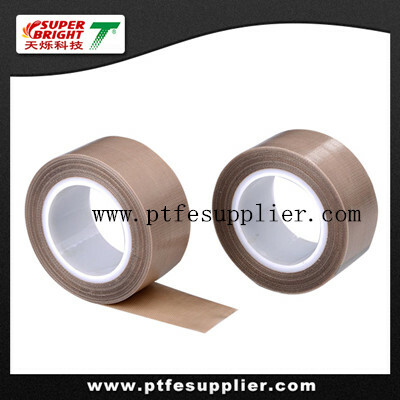 Premium PTFE Coated Fiberglass Tapes with acrylic adhesive backing is made from a very tightly woven fiberglass cloth that has been heavily coated with PTFE/(polytetrafluoroethylene) and has a high-temperature, pressure-sensitive acrylic adhesive applied to one side. It has two types: one has lining, the other hasn’t. This product has a greater PTFE coated weight providing a smoother surface with enhanced durability compared to Standard PTFE Coated Fiberglass Tape, so it has the best release characteristics, highest dielectric strength, greatest chemical resistance and longest working life of any our PTFE Coated Fiberglass tape. It combines the excellent properties of PTFE and the excellent strength and dimensional stability of the fiberglass, created for industry's most demanding applications. Acrylic backing offers the highest available bond strength for applications which require very persistent adhesion. It adheres reliably in a temperature range of -87° to +275°F (-60° to 135°C). The durability and anti-stick properties of these products make it an ideal material for the lining of guide rails, chutes and slides. The high temperature capabilities and non-stick properties allow these products to perform as an excellent release surface in the composite aircraft industry. These Premium grades are also frequently used by the packaging industry as a release surface on heat sealers, blister formation and form-fill-seal equipment.